The Eveque Sportshall Development Team have developed an annual international relay competition. This incorporates both the World Marathon Challenge (suggested for Secondary aged students) and the 5000m Challenge (for Primary aged children). Students from all over the world will compete to break (and set!) new World Records over the Marathon and 5000m distances! We know schools have busy schedules so this year we are keeping the competition open until 14th June. Simply pick a date that suits and run. Our official Launch week will be the week commencing 8th October 2018. Our Finals week will be the week commencing 10th June 2019. The opportunity exists to utilise the Finals week as a second trial with your team competing against their time set earlier in the year. Any age – adults can take part too! 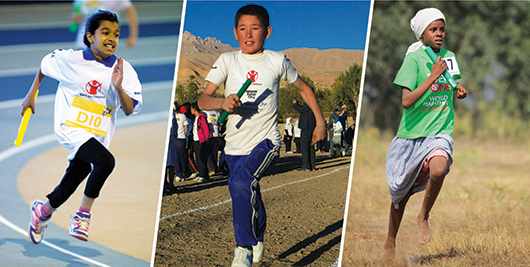 The main World Marathon Challenge competition is for mixed teams made up of equal numbers of boys and girls from the same school, in the 13 and under category. There are additional competition categories for single gender teams, non-school teams and teams of older runners. We recommend that primary school teams enter the 5000m Challenge instead of completing the full marathon. Stage your event on a running track or field. The marathon distance is divided into sections of 200m. Teams are made up of 26 to 36 runners – each person completes up to 9 sections. Results are logged on our World Leaderboard. Find out about the competitions for UK teams. The challenge: try to beat the world marathon record! For information on how to take part in the World Marathon Challenge please visit the Competition Centre (link at the side of the page).